Small-sized precision-tuned xylophone for your child. This percussion musical instrument develops not only the ears, but gross and fine motor skills. 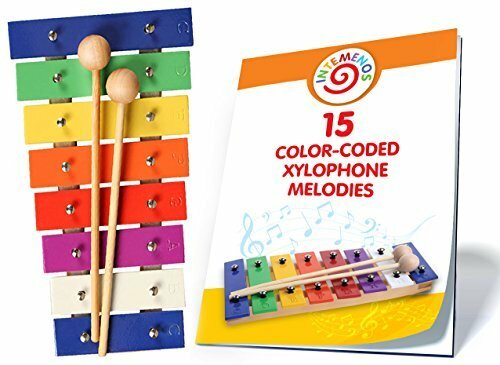 Color keys of this color music toy xylophone glockenspile makes it easy to learn to play. Includes the sheet music e-book with 15 songs just for this xylophone. Each melody is written with color circles, representing the colors on the xylophone. This makes it easy to play, even for adults who can\'t read music. This glockenspiel provides hours of fun. This metallophone has 8 notes (a diatonic scale in the key of C), comes with 2 mallets, and has brightly colored metal keys.